Nottinghamshire's Trent Bridge will host two Ashes Tests after the England and Wales Cricket Board announced international venues until 2016. Lord's and The Oval will also stage games in 2013 and 2015, but Headingley and the Rose Bowl miss out. The other 2013 Tests will take place at Old Trafford - which last staged one in 2005 - and Durham's Riverside, a new addition to the Ashes roster. Cardiff and Edgbaston will host the remaining two Tests in 2015. The ECB delivered the independent major match group's decision, not just on which venues will stage the next two Ashes series, but also many other international fixtures between 2013 and 2016. Headingley and the Rose Bowl will host one-day internationals against Australia and Tests against other tourists while Bristol will host New Zealand, India and Sri Lanka in ODIs. For Nottinghamshire in particular, the revenue they can generate from the Ashes Tests at Trent Bridge will come as a vindication of their decision to spend millions of pounds upgrading facilities. "It is absolutely enormous," said Nottinghamshire chief executive Derek Brewer of the decision to award his county Ashes Tests in consecutive series. "One of our objectives was to get Trent Bridge at the forefront of international cricket. We have certainly achieved that. It's been a massive team effort, a very long and exacting process." Lancashire chief executive Jim Cumbes said the announcement heightened the feelgood factor at Old Trafford. "This has been our goal since 2006," he said. 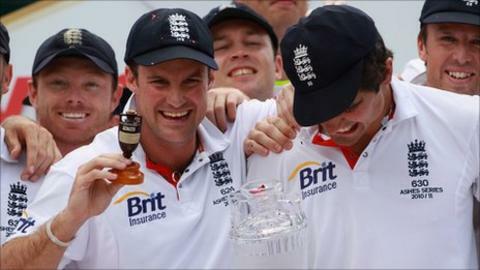 "We are delighted to see the Ashes return to Old Trafford. It has certainly been a fantastic couple of weeks for the club - winning the county championship after such a long wait and the final seal of approval to proceed with our redevelopment. The bidding process was introduced as the building of new grounds means there are more venues vying to stage matches. The six traditional England Test match venues - Lord's, the Oval, Old Trafford, Trent Bridge, Headingley and Edgbaston - have been joined by new grounds at Chester-le-Street and Southampton's Rose Bowl. Cardiff joined the Test ranks in 2009 after extensive redevelopment. Bristol has regularly hosted one-day internationals but never a Test. "This is just the icing on the cake." Colin Povey, chief executive at Warwickshire, said "While we are disappointed not to have been awarded an Ashes Test in 2013, we should remember the Aussies will play one-day internationals at Edgbaston in 2012 and 2013," he said. "In addition, we can now look forward to an Ashes Test in 2015." The major match group is chaired by Lord Morris, who explained the decision-making process. "Lord's is the home of cricket and demonstrated to the major match group its unique iconic status and the exceptional benefits which staging major matches at Lord's can bring to the game," he said. "The MMG also noted the MCC's commitment to further develop the facilities at Lord's as well as the significant support which MCC provides to university and community cricket in England and Wales and the game around the world. "As a result of these exceptional characteristics, Lord's has been awarded the 'platinum package'." ECB chairman Giles Clarke added: "The quality of the submissions made by the venues was outstanding and reflects the importance to regions as well as venues in staging major matches. "The awards for the next five-year period will enable counties to review and where necessary revise their business plans with the certainty of their match programme over a substantial period of time.